What Sets a Spirit of Play /Sherman Weddings Apart From the Rest? •Love the Artistry of Weddings. It might seem simplistic, but we just genuinely love weddings and it shows in our work. They are one of the favorite things we film says Gigi Faraci Harris, president Spirit of Play. We strive to create the most stirring, authentic, and artistic wedding videos possible. It’s the biggest day of your life and it will only come once, so trust your wedding memories to the highly specialized experience of Spirit of Play Productions. When you hire Gigi Faraci Harris and Spirit of Play to facilitate your wedding, you are hiring more than just someone to record your wedding day. You are hiring a company to set the mood and emotion of this most important day. star. YOU are the stars. away the tears when he hears his little girl say, “I do”. • A Low Key, Unobtrusive Presence. To the extent possible, we prefer to keep out of the way and to not stage shots but instead to capture a more organic record of your most important day. We try very hard to let your wedding day unfold as you intended and to keep the attention focused on you, not us. 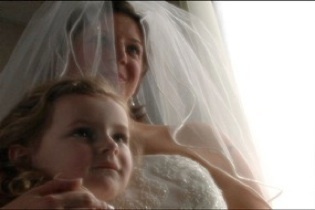 You can trust us to film quality video that won't interfere with your important day. •Full-Time Experience. We have no other priorities beyond creating an outstanding video of your wedding day. • Happy Past Customers. The greatest part of our job is experiencing the response of our clients upon receiving their completed wedding DVDs. Seeing a couple laugh and cry together while watching their video for the first time, or hearing about a dad’s reaction to seeing his Father-Daughter dance onscreen makes the many late hours of editing extremely worthwhile. 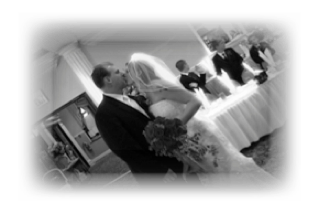 •Our Signature Cinematic Full-Length Edit Your completed video features a highly polished, deeply moving full-length "exactly as it occurred" version of your wedding ceremony and the major events of the reception, rehearsal and rehearsal dinner. • Whether you wish to be swept by the emotional imagery of the cinematic musical highlight edit, or sit back and relive every single word that was spoken, it's truly the best of both worlds! • Professional Equipment Our philosophy is to capture the moment of your special event using the highest quality digital videography equipment, at competitive rates. We shoot using extremely high-end 3 chip HD camcorders, resulting in lusciously drenched colors, exquisite detail, powerful close-ups and excellent low-light sensitivity. Audio is provided by professional UHF wireless microphones--almost unnoticeable and yet sensitive enough to pick up a whisper. The result in crystal clear, lifelike sound. We use a counter-balanced steady cam for smooth steady movement. This is ideal for walking footage or candid shots. Most of your video will be shot using a fluid-head tripod for the most steady and watchable footage possible. All wedding movies are shot Glide-cam motion stabilizers. The Glidecam is essentially a set of gimbals and counterweights used to stabilize a camera during movement. This is the roving camera used at the ceremony and reception. • Multi-camera Coverage. 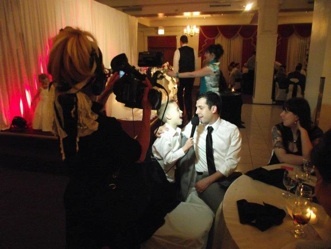 Our creative wedding videography expertise has made Gigi Faraci Harris and Spirit of Play Productions Chicagolands premiere wedding video services company. At Spirit of Play, our goal is to raise the level of wedding video production services to that of a big budget Hollywood film. How do we do it? Our Chicago based videography service specialists shoot with Multiple cameras to capture your event from every angle. No risk of missing a shot that won't come again like with a single camera! Our advanced wedding packages include the redundancy and expanded perspective of at least two live-operated professional cameras, as well as an unmanned third camera for the wedding ceremony. With 3 cameras and multiple audio tracks, we take pride in introducing the most extensive wedding coverage available. With only one take available planning is the key to success. Our multiple cameras will be ready when you walk down the isle. • All-Digital Production & Editing. Editing is done in our 100% digital non-linear editing suite, including editing, color correction, sound, music, motion graphics, 3D titling and visual effects seamlessly orchestrated to fit your particular project. And since it’s completely digital there is no loss of quality compared with the original footage. •Highest Quality DVD Media Available. When we author your DVD, we add many chapter points, so that you can easily navigate to the memories that you like watching the most. The bride and groom's final video is transferred onto exclusive archival DVD media. Comprehensive Approach. Rest assured, your memories will be safe for generations. Bride, Groom, Best-man, Maid of Honor, and two additional persons. A great way to share how you are feeling about the big event, share how you met, and to get insight from your friends and family to relive for the years to come. This interview can be added to the final Wedding DVD as voice over to the first dances, Bride and groom dressing, etc... as well as the Love Story Video. Don’t leave out the Rehearsal and Dinner Executive Producer Gigi Faraci Harris and Spirit of Play encourages all couples to include videotaping the rehearsal and dinner. Speeches take place at the dinner that may not be happening during the wedding. These speeches and well wishes can than be used in the final wedding DVD as voice over, split screen or as an event in itself. Videotaping the rehearsal allows the editor to cross fade from the Rehearsal to the wedding. A unique result that can be extremely effective. Watch throughout samples. 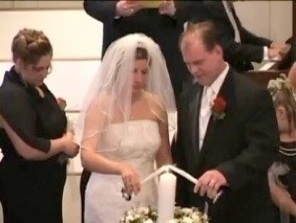 •Video Guest Book A great option (and personal favorite) is the 'Video Guest Book'. The Video Guest Book is footage from a camera that is set up separately or roaming, just so that your guests can tape personal messages for you to hear and watch later. One of the most common complaints couples have once their day has come and gone, is that they didn't have a chance to really speak with every one that attended. •Complimentary DVDs for Parents. Besides yourself and your fiancé, no one is likely to be more interested or more involved in your wedding than your parents. Each set of parents receives their own custom-packaged copy of your finished DVD to cherish, free of charge. Spirit of Play also provides you with 3 to 12 personalized DVD copies that include motion menus and chapter selections. Your memories end with rolling credits that name your wedding party, family and friends. Spirit of Play also does an online video stream of your highlight reel on their web site so that you can share your video with friends and family around the globe completely free of charge. •Thank-You Video. Spirit of Play offers Thank-You Videos as a unique way to say 'thank-you' to family and friends. This video will contain a thank-you message from the bride and groom, and highlights from the wedding. It's a great way to supplement your thank-you cards! •Honeymoon Montage A 'Honeymoon Montage' is an option that is made up of photos from your honeymoon, set to music, and put at the end of your wedding video to complete the picture. wedding suppliers during their wedding day. *We’ve done numerous weddings in the Chicagoland area and therefore know the best filming locations in churches and reception facilities. *The clergy feel very comfortable having us recording in their churches. This means a considerable level of comfort to you, clergy and Hall staff. Clergy are apprehensive of amateurs who understandably don’t know protocol and may create problems during the ceremony. *Your wedding day is such a special day in your lifetime. There is also a considerable amount of stress for you and your family. With our vast experience we are very sensitive to this. *Our style is very classical and very watchable. Our production values are high and we know from experience how to capture those highly emotional times during the day. The Spirit of Play approach is subtle and sweet, photojournalistic and professional. Our videos capture laughs and smiles, tearful whispered vows, goofy grins from the best man, bittersweet expressions from Mom and Dad as they watch their little girl or boy grow up... Music selections for the videos are chosen by the couple, so that there are no surprises and the video is that much more meaningful. 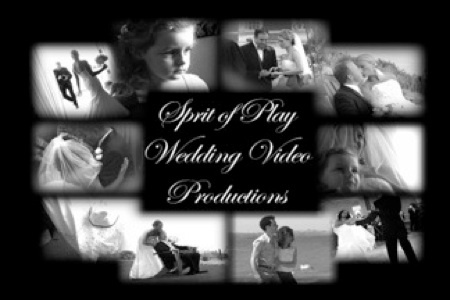 Spirit of Play Wedding Video services such Illinois Towns as Barrington, Schaumburg, Lake Forest, Palatine, Glenview, Glencoe, Northbrook, Arlington Heights, Lake Bluff, Buffalo Grove, Palos Heights, Plaos Hills, Wheaton, Bolingbrook, Naperville, Lyle, Streamwood, Hoffman Estates, Elk Grove Village, Oak Park, Geneva, St Charles, Rockford, Joliet, Bartlett, Batavia, Sugar Grove, Aurora, Long Grove, Highland Park, Elmhurst, River Grove, Gurnee, Waudegan, McHenry, Villa Park, Skokie, Morton Grove, Des Plaines, Prospect Heights, Hawthorne Woods, Cary, Zion, Lake Zurick, Palos Hills, Elmhurst, La Grange, La Grange Park, Sugar Grove, Barrington Hills, Lake Geneva, Galena, Oak Brook Terrace, Hanover Park, Lake in the Hills etc.... Our Wedding Videographers will travel to all Chicago Locations.